Much is going on in Korea. It is and will be a place to watch for Open Source GeoSpatial, with the likes of Sanghee Shin and all his local chapter OSGeo compadres leading the charge. FOSS4G Korea was part of Smart Geospatial Expo 2014 this year, and during the expo, Sanghee was awarded a prize from the South Korean president for his work in promoting Open Source geospatial technologies. To hear Sanghee explain it, Korea is very much interested in growing its industries through the minds of their people. The great successes of South Korea in the recent past have not been dependent upon the natural resources of Korea, but the intellectual capital of firms such as LG and Samsung. With this in mind, Korea wants to grow it’s software industries from native seed. Sponsorship of Open Source GeoSpatial technologies will be part of this initiative. It seems that they have the talent, the energy, the love of topic, and now the financial resources to start leading. This will be really fun to watch. But, for this post, I want to focus on the tale of three Stephens, perhaps an echo of narcissism, but an interesting filter for our post today. Not long before I left for this trip, I contacted Sanghee to ask if there were any parks + GIS folks I could connect with while here to talk. 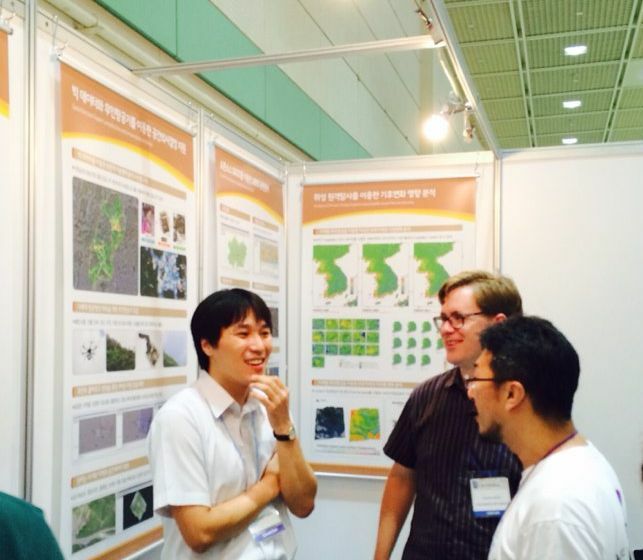 It turns out, Mr. Byeong-hyeok Yu was presenting at FOSS4G Korea on the use of QGIS for remote sensing for the Korean National Park Service. Mr. Yu is one of two GIS people working at KNPS, the other is with their research branch. Mr. Yu was good enough to invite me to headquarters, give me the overview on smartphone apps, QGIS analyses, UAS (drone) flight work, Google StreetView like trail work (in partnership with Naver maps, I believe), and other cutting edge initiatives they are working on. What FOSSGIS has enabled under Mr. Yu’s stewardship is the ability for not just Mr. Yu to do GIS, but also for him to democratize the process and allow a few hundred of KNPS park rangers to use QGIS on their desktops as well as to be the bearers of the equipment for the trail camera project. I like to think of Mr. Yu as a more bright and energetic version of me. After all, he is a FOSS4Geospatial parks guy. So, we’ll call Mr. Yu Stephen Mather number 2 (I did call this narcissism, right). But here’s the real reason for the tale of three Stephens. Whoever has studied the history of the National Park Service in the US knows of Stephen Tyng Mather, the borax mining magnate and essential founder of the National Park System, who oversaw the development of 20 National Parks in his short tenure. While visiting the headquarters of KNPS, I was given the privilege of an audience and traditional Korean tea ceremony with tireless servant, Stephen Tyng Mather equivalent, and employee number 1 of Korea NPS, Mr. Young-Deck Park. Mr. Park has seen the KNPS from an idea to 21 parks covering more than 3-percent of Korea’s land area (more than 6% if you include the ocean refuges). In short, I was in the presence of a parks visionary and giant. Stephen Mather number 3. I won’t lie. I had to hold back tears. Oh, and the green tea was the best I have ever had. 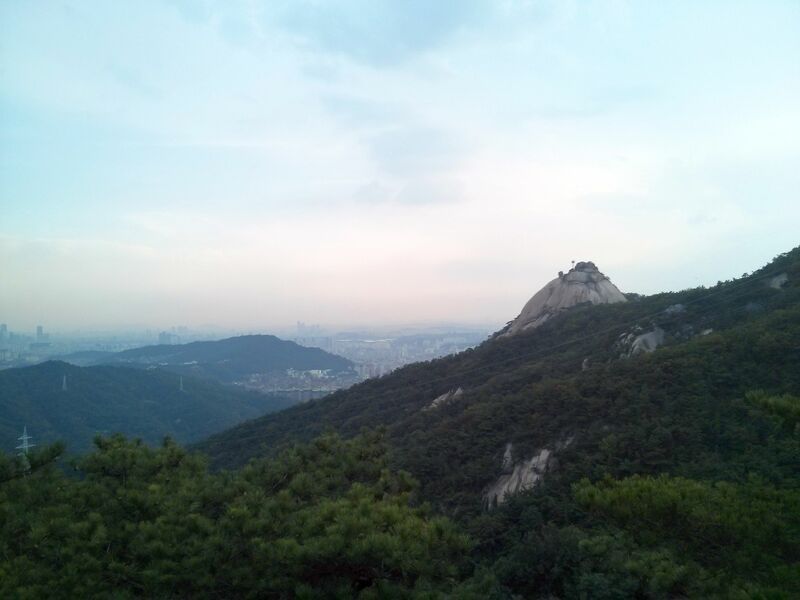 To close this post, I’ll show you a view from KNPS’ most beloved, and least remote National Park — Bukhansan, which sits north of the Blue House (Korea’s equivalent of our White House) and partially inside the city of Seoul. At 11 million visitors a year and about 19,000 acres, it is quite popular. I hiked one of the ridges with one of their rangers. More on that in another post. Quick addendum, while Mr. Park is the lone GIS person inside his branch of KNPS, I should point out that I am not alone in my Park District. I work with 3 permanent and 1 seasonal staff who are exquisitely talented and dedicated, which is my great great privilege.